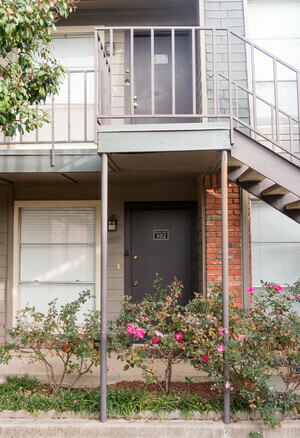 Escape to McCart Apartments and experience a quiet and peaceful setting just across the street from the TCU campus. In addition to convenient off-street parking, our apartment homes offer spacious living areas, large walk-in closets, oversized picture windows with blinds and custom home amenities, which include vinyl hardwood floors in select units. An on-site clothes care center is available around the clock. Relax in one of our lushly landscaped courtyards and enjoy the cool breeze or catch-up with a neighbor. Our location is hard to beat. Limitless recreational activities, entertainment, shopping and restaurants are all within walking distance. We are nearby Downtown, too. Our professionally trained staff is dedicated to its residents and always striving for excellence. We would love to show you why McCart Apartments should be your new home!